There’s something to be said about people who Feel The Fear and Do It Anyway. Success usually follows. One of our boot campers, Marie Wiles from Santa Clarita, is a perfect example of acting in spite of fear leading to success. “I wasn’t making wise choices with what I ate nor was I exercising enough to keep myself healthy. I’ve always had blood pressure and cholesterol issues and basically wasn’t doing anything to even help that. “In my first 10 weeks of boot camp I lost 10lbs. I’ve now lost 45lbs and gone from a size 14 to a 2 (sometimes a size 0)! Just recently Marie dug up a picture of she and her kids from a 2011 issue of Santa Clarita Magazine. When she showed me the picture she was horrified that it was even in a magazine. But now she considers it her “before” picture, and a reminder of how far she’s come and where she doesn’t want to go back to. Way to go Marie! Acting in spite of fear really does lead to success. I tried to figure out Marie’s “secret-formula” then she just told me. “Everybody just needs to face their fears because they will realize that little-by-little there will be results and in time those little results get added up to make a big difference. I really dragged my feet to start boot camp but saw results because of it that brought a sense of accomplishment and satisfaction. Marie’s journey has been such an inspiration to watch. 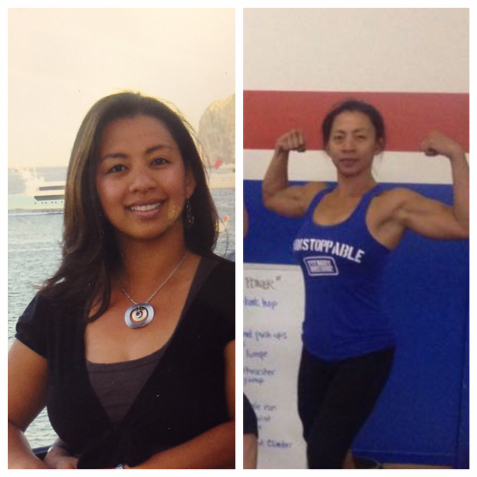 As she kept reaching the goals she set for herself you could see a different Marie emerge. The new Marie is filled with energy and enthusiasm. In fact she has so much of it she’s now one of our amazing coaches. Being a mom isn’t easy. If you’re dragging your feet and need a shot of inspiration to jumpstart your journey come try a workout with a lady who knows what it was like to be on the back burner. Just shoot us an email at SCFitBody@gmail.com. This entry was posted on May 6, 2015 at 8:30 am. You can follow any responses to this entry through the RSS 2.0 feed. You can leave a response, or trackback from your own site.